Yes, the former Soviet Union would be paradise if it were not for those violent independence activists. Awkwardly, that is the inadvertent message of Dave Bautista’s new throwdown. Hopefully, the former wrestler-turned-actor can keep all those troublesome potential breakaway autonomous republics in line. He will also have to rescue a British football (soccer) stadium full of fans in Scott Mann’s Final Score (trailer here), which opens this Friday in New York. Blame the Belov Brothers. Dimitri was the parliamentarian, who inspired his people to rise up in defiance of their Russian oppressors, or wise stewards, or whatever. His brother Arkady was the general who made sure it was as bloody as possible. When Dimitri died, the revolution died with him. However, the can’t-see-the-forest-for-the-trees Arkady has learned his brother faked his death and has been living under an assumed identity in the UK. However, he will be in the stadium for an important match between West Ham and Russia. Logically, Arkady decides to take control of the stadium, wire it up with a dumpster’s worth of C4, force the Brits to give away his brother (who will happily return with Arkady to reignite the carnage), and then let all the hostages blow up when the game clock hits ninety minutes (gee, what if there’s stoppage time?). Of course, he didn’t plan on having American mercenary Michael Knox in the stadium. Wisely, screenwriters Jonathan Frank, David T. Lynch, and Keith Lynch refrain from calling him “Hard Knox.” He has no interest in FIFA-style football, but he has brought Danni, the daughter of a fallen colleague who now calls him “Uncle Mike.” She is a fan, but she is also inclined to knock off with her deadbeat friends, making it hard for Knox to keep tabs on her when things start to explode. Okay, so this isn’t a spectacularly original premise. In fact, the whole Die Hard in a stadium thing has already been done at least once before. However, you have to give Final Score credit for a spectacularly brutal fight scene in the stadium kitchen, involving fry baskets. Bautista is generally pleasant to spend time with and he certainly has the chops for all the fight sequences. (As a pedantic aside, he is way too huge for a climatic scene to make sense, but hey, whatever.) Ray Stevenson is also well in his element, snarling and chewing the scenery as Gen. Belov. The one-sheet doesn’t lie—Pierce Brosnan is in this movie too, but viewers will have to wait a while to see him in anything but crowd scenes. Ralph Brown and Julian Cheung add some attitude as Superintendent Steed and Agent Cho, but let’s be honest, even if it an homage, just using the name “Steed” really risks annoying all the Avengers fans out there. 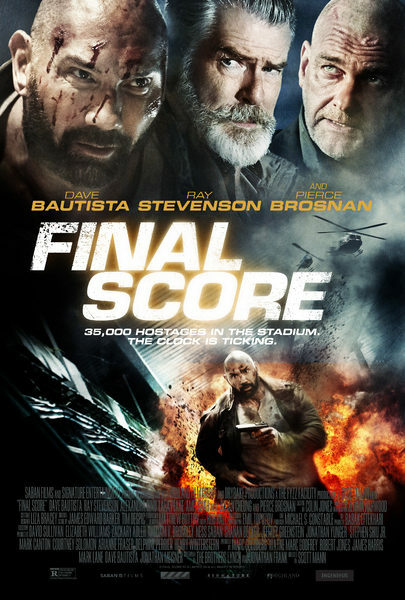 As an old school action movie, Final Score has a good deal going for it. Politically, it is just a mess. Beyond its confused and not particularly helpful depiction of post-Soviet independence movements, it spends an excessive amount of time on Faisal Khan, an usher helping Knox, just to ram home the point not all Muslims or South Asians are terrorists. Evidently, the film wants viewers to think of them as annoying and ineffectual instead. Wow, what a victory for multiculturalism. Yet even with those frequent PSA interruptions, it has some meathead charm. Recommended accordingly, albeit with the afore mentioned reservations, Final Score opens this Friday (9/14) in New York, at the Village East.